Could the Angels buy AND sell at the deadline? It’s a question I asked myself before going to sleep last night. What if Billy Eppler throws the baseball world a curve ball and decides to buy for the future even though his team isn’t in it in 2016? It’s been done before. With the Angels firmly out of the race in 2010, they swung a deal for the premier ace pitcher on the market, Dan Haren. They paid a hefty price, but by most measures, the Angels won that deal. Similarly in 2015, the Rangers acquired Cole Hamels at the deadline, being a long shot in a race that saw the upstart Astros and reigning champion Angels battling it out. As the fates would have it, the Astros collapsed under the pressure and the Angels just flat out choked, allowing Texas to worm their way into a division championship. So as we can see, it has happened before. But what I’m suggesting is a slight variation of the aforementioned methods of acquiring talent. I’m talking about reallocating value, both buying and selling at the deadline. Trying to build a new team. Let’s say the Angels decide to trade Yunel Escobar to the Mets who are in desperate need of offense, particularly from third base. The Mets in this theoretical scenario would send SS Gavin Cecchini to the Angels. Cecchini himself isn’t a very good defensive SS, but most scouts believe he’s destined to move across the bag to second base anyway. It’s his bat that will get him to the majors and Cecchini, while not blowing anyone away in homers or stolen bases is putting up some impressive numbers in terms of batting average and on base percentage. Kaleb Cowart looks ready to take over as the Angels starting third baseman. In Escobar’s place, the Angels would promote Kaleb Cowart, completing the plan we all saw in 2010. There may have been a few twists and turns along the way, but Cowart is hitting quite well in AAA and is clearly the marquee defensive third base prospect on planet earth. As we’ve seen with Andrelton Simmons, value can be accumulated through excellence on defense just as much as it can at the plate. Cowart would step in and immediately be one of the better fielding third baseman in the Major Leagues. Though there are questions regarding how his bat will transfer to the majors, there’s little doubt Cowart would be of significant value. Plus it would give the Angels the best defensive left side of the infield in baseball, and we know that makes Eppler happy. 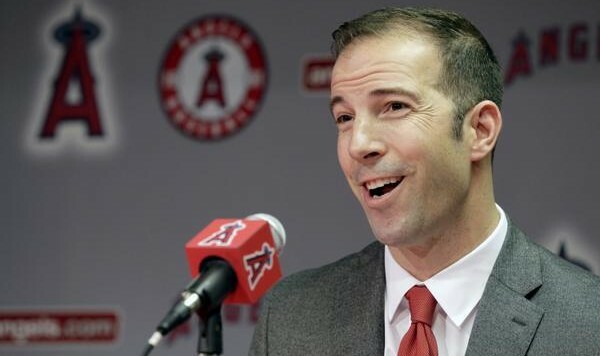 Moving on…….if the Angels really do intend to sell, they might as well do it right. Tim Lincecum is basically auditioning (wearing an Angels uniform) for the rest of 2016 and the future. Timmy-Jim has had up and down performances for the Angels thus far, but for the sake of conversation, let’s say he’s reasonably solid down the stretch, he should have some value at the deadline. Enter the Dodgers. In need of a starting pitcher, and bullpen piece. As it just so turns out, Timmy can be used in either role. Plus you have to admit, seeing Lincecum in Dodger blue, the psychological damage it would inflict on Giants fans would be worth reading and laughing about. The Angels aren’t likely to reap much in this type of deal, but they could probably come away with a prospect like RHP Chase De Jong. De Jong is a potential 4-5 starter with a 91-93 mph fastball and a decent breaking ball, fringe change up and clean mechanics. He won’t be winning any Cy Young awards likely, but in a year or two, if things break right, he could emerge as a Tropeano or Shoemaker type of starter, which this ball club needs. Finally, let’s say they trade Jhoulys Chacin for the infamous PTBNL (player to be named later), and Joe Smith for a random future reliever like the Angels did when they acquired Cory Rasmus for Scott Downs. The result is the Angels have themselves a couple more solid prospects in Cecchini and De Jong to go along with the exciting draft Eppler and co. managed to put together. It’s the necessary influx of talent the Angels farm system has needed. But now, let’s say the Angels went out and decided to buy, just after they got done selling. Wil Myers of the Padres is having a breakout year and looks to be the belle of the ball at this point. What if the Angels swooped in with an offer like C.J. Cron, Gavin Cecchini, Chase De Jong, Victor Alcantara and Joe Gatto for Will Myers? For the sake of conversation, let’s say the Padres are interested. Since mid-April, Cron is hitting .297/.343 with 13 doubles and 6 HR’s. It’s looking more and more like Cron has turned the corner, The Padres would have Cron on the cheap for 2017, 18, 19 and 2020. In Cecchini, the Padres would have another middle infield option to consider, this one actually being able to hit. De Jong would no doubt be useful to a San Diego team that has been missing Tyson Ross and Andrew Cashner all season, and perhaps forever. Alcantara at this point could go either way in regards to the rotation or bullpen, but regardless the Padres would for sure be intrigued by the mid to high 90’s octane. Finally, Joe Gatto is a young reclamation project with mid-rotation upside. In return, the Angels finally solve their leadoff and left field problems for 2017, 2018 and 2019. In a addition, the Angels would also open up a spot at 1B/DH, and Jefry Marte seems to be destined for that role. Matt Moore of the Tampa Bay Rays is also a name that’s been floated as a potential trade candidate, and the Angels need young controllable pitching with upside. Moore was once a top prospect mentioned in the same breath with Mike Trout and Bryce Harper, but since his spectacular debut and sophomore season, Moore has struggled with injuries. After opting for Tommy John surgery in 2014, Moore understandably had a shaky 2015. 2016 hasn’t gone as planned either, though four of his last five starts have been quite good and his velocity is climbing back toward his original levels. Moore is making 5 million in 2016 and has three more option years at 7 million, 9 million and 10 million, each coming with a reasonable buyout. The last time the Angels traded for a lefty struggling to get back to previous highs from the Tampa bay Rays with a reasonable contract was Scott Kazmir, and that didn’t exactly work out too well for the Angels. But silver lining, it at least gives us a pulse as to what sort of deal it might take to get Matt Moore in an Angel uniform. Kazmir cost the Angels Sean Rodriguez and Alex Torres. At the time, Rodriguez was seen as a potential starting 2B/SS/3B or at the very least a utility infielder with upside, while Torres was seen as a back rotation candidate in a couple years. Obviously Rodriguez never lived up the minor league numbers and Torres ended up finding more success in the bullpen, but that doesn’t matter so much now. In order to get a deal done here, the Angels are probably looking at Ji-Man Choi, Kyle McGowin, and an upside prospect like Julio Garcia. The Rays would get an intriguing 25 year old LF/1B option in Choi, who hasn’t experienced success in the majors yet, but he is hitting .324/.401 with 15 extra base hits in only 36 games in AAA. McGowin is a 24 year old mid to back end of the rotation candidate in AAA suffering from the Pacific Coast League blues (where every medium depth fly ball turns into a HR). His ERA currently sits at 5.35, which is about average for the PCL. And Julio Garcia is a very good, very young defensive shortstop that is just beginning to grow into his body. He hasn’t put up the numbers yet, but at just 18 years old, he profiles to have both speed and power at some point in the future. Rotation: Matt Moore, Matt Shoemaker, Nick Tropeano, Tyler Skaggs and….Garrett Richards (if healthy) or Nate Smith or even a free agent like Rich Hill, Doug Fister or Andrew Cashner. The end result here isn’t necessarily an Angels team that takes the field in 2017 as World Series favorites. But they would be an elite defensive unit, that is considerably younger and a more dynamic than its 2016 counterpart, all while sinking back below the luxury tax threshold and holding onto their current prospects of worth such as Matt Thaiss, Nonie Williams, Taylor Ward and Jahmai Jones. Plus, dreaming on the type of numbers Myers, Trout and Calhoun could put up together is just plain enticing.